In this series we’ve looked at boxes that take certain inputs and then produce an output. We’ve called such boxes operators, and we’ve thought of them in many different ways. In some cases, the boxes perform arithmetic; in other cases, there doesn’t seem to be any arithmetic involved. In some cases, it looks like the boxes must contain fancy electronics; in other cases, we’ve seen that the box might just contain a rodent who’s good at reading graphs. Unless you need to build one of these boxes yourself, it might not matter in the slightest what’s in the box, as long as you have a good idea as to what the box does. Maybe the box comes with instructions that tell you to replace the battery in the battery panel annually, or how to replace the food pellets for the rodent. In the last two posts, we saw equivalence classes as well as contour lines that connected elements that were equivalent to each other. The contour lines could be followed till you arrived at a specially marked entry that serves as the representative of that equivalence class. The process of finding the marked representative of an equivalence class is itself something we can think of as an operator, as something done in a black box. How the box does this may not be of our concern; the box might follow contour lines as in our examples, or it may have other ways – better ways perhaps – of finding the representative element in the equivalence class. Typically, operators that find the representative member of an equivalence class are not invertible. That is, many different elements can lead to the same representative member, and from the representative member alone, you can’t recover which of the elements led to it. A complication with finding the representative member of an equivalence class is that there is some uncertainty about which element is the representative member. Strictly speaking, there is nothing about the equivalence that shouts out which member is the representative member, it relies on an outside perspective. With respect to one property, all elements in the equivalence class are the same – that’s how they get to be members in the equivalence class in the first place. Yet with respect to some other property, one element of the equivalence class stands out and is marked and thus becomes the representative. It’s time for an example to make this explicit. In the table on the bottom, some of these equivalencies are shown. 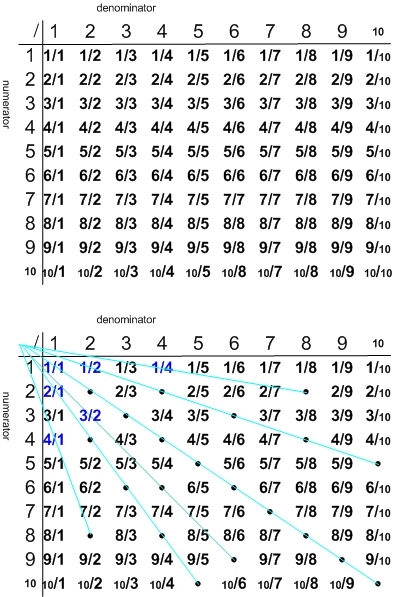 All fractions equivalent to 1/2 are replaced by a contour line that connects them to 1/2. The fractions 2/4, 3/6, 4/8 and 5/10 are so connected. Turns out, these equivalent fractions form a straight line, and this line, when extended, goes through a point in the top left corner. There are more equivalent fractions in the table than are shown, but I left them out to keep the main ideas visible. The last (closest) fraction on the blue line towards the top left is marked in a special color, and is chosen to be the representative of the equivalence class of equivalent fractions. These correspond to what are called reduced fractions or simplified fractions in school. In school, reducing fractions often seems like a chore, and its purpose hidden in the mumbling and mist of “they are simpler”. Later in school, you are asked to find a different kind of representative of the equivalence class: a fraction, equivalent to the one you start with, that has a denominator of exactly 100. These are called percentages. In the world of percentages, divisions where the denominator is 100 are more equal than others. In the next post, we’ll look at equivalent subtractions. This entry was posted in Uncategorized and tagged black box, equivalence, extending patterns, invariants, models, representations, reverse engineering, whole vs. parts. Bookmark the permalink.